Fisayo Falodi, Success Nwogu, Jesusegun Alagbe, Enyioha Opara, Peter Dada, and Armstrong Bakam and many Nigerian students studying abroad have been seeking transfer to Nigerian universities to complete their education at home because of the scarcity of foreign exchange. 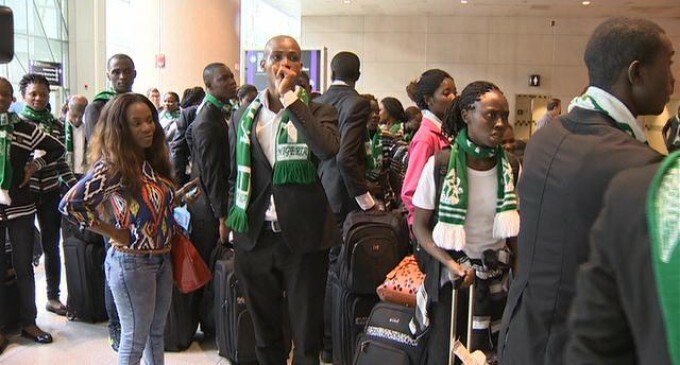 An Ogun State indigene, Babatunde Agboola, who is studying in the United States, told one of our correspondents that he and some of his friends had agreed to return to Nigeria to complete their studies. “The message we keep on receiving from home every day is that dollar is scarce and this is affecting our education,” Agboola said. A large number of Nigerian students are studying abroad, mainly in the United States, the United Kingdom and Canada, among others. A 2015 report by the Institute of International Education’s Open Doors Report on International Educational Exchange, the United States, claimed that 9,494 students from Nigeria were admitted in the 2014/15 academic session, making Nigeria the leading source of students from Africa and the 15th largest country worldwide among international students in the US. Nigerian universities, especially the private ones, have however, expressed interest in providing spaces for willing students interested in their respective institutions. The universities assured the concerned students of standard learning facilities like those found in tertiary institutions abroad. For instance, Babcock University said it was interested in accepting transfer students. It allayed the fears of concerned parents who could not afford expensive forex and urged them to seek placements for their children in the institution. The university also promised interested students world-class learning facilities. It listed integration of international professional certifications into academic programmes and well structured and uninterrupted academic programmes, among others, as some of the benefits interested students were bound to enjoy. A senior official of Babcock University told one of our correspondents on the telephone that many foreign students had been seeking transfer to the institution. He said the opportunity was open to Nigerians who actually left the country to school abroad and those who were born there. The official said, “It is surprising that many parents said their children would not have completed their education abroad, but for the opportunity created by Babcock University to assist stranded students. “So many people have been coming to us to seek advice on how to handle their transfer. All they need to do is to apply and come with their transcripts. Achievers University, Owo, Ondo State, has admitted a few of the students who sought transfer from abroad to the institution. The Registrar, Al-Hikmah University, Ilorin, Alhaja Rasheedat Oladimeji, expressed the hope that the university would record influx of foreign transfer of students. She, however, stated that the university had just started admission for the next academic session and was hopeful that some foreign students would seek transfer to the institution. The spokesperson for Afe Babalola University, Ado-Ekiti, Ekiti State, Mr. Afeez Olaniyi, said the institution was prepared to accept returnee foreign students. “We will be glad to receive them. Yes, we do accept foreign students if they meet the requirements. We have been accepting over the years,” he said. Asked if the institution had been receiving requests from overseas students, Ayewole asked Saturday PUNCH to forward an email to the school’s registrar. However, the registrar had yet to respond to the request as of the time of publishing this story. But an official of Landmark University, Omu-Aran, Kwara State, said the institution doesn’t accept foreign students. He said, “If the concerned students have passports, they will be admitted as international students, but they cannot serve in the National Youth Service Corps scheme after the completion of their programmes. They have to go abroad for their Master’s before they can serve. Though it has been receiving transfer requests from Nigerians studying abroad, an official of Covenant University, Ota, Ogun State, said the school does not accept such requests because of its “peculiar” curriculum. Meanwhile, some parents whose children are schooling abroad have said that their final year students have been engaging in menial jobs, among other means, to sustain themselves. A parent, Mrs. Abigail Ademuyiwa, whose son is studying in the University of Kyiv, Ukraine, stated that her son was in the final year, but had been seeking scholarship to complete his education following her inability to send money to him. A man, Alhaji Ahmed Sani, said he would have loved to bring his 21-year-old son from Ghana to complete his education at home, but he was constrained because he was in his final year. Sani said, “The tuition I paid in his first two years was not up to what I paid after the forex crisis. Before, I used to pay N200, 000 per session, but I now pay N400, 000. He, however, told one of correspondents that two of his friends whose children still had more than two academic sessions to complete their studies had sought placements for them in Nigerian universities. A Minna-based businessman, Alhaji Jebo Mohammed, lamented that it had not been easy for him to access forex to fund his children’s education abroad. Mohammed, however, said in spite of the forex crisis, he would endeavour to ensure that they finished their education abroad. “It is a commitment and task that must be done,” he said. The Vice-Chancellor, Caleb University, Imota, Lagos State, Prof. Ayandiji Daniel Aina, said though his university had yet to receive applications from students seeking transfer from abroad, it was logical for parents who could no longer afford their children’s tuition because of the forex crisis to bring them back home for the completion of their studies.